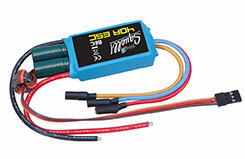 All Products > "Z-PH019-05 Phase 3 Squall 40Amp ESC (11.1v)"
Standard ESC used in the Phase3 3S Squall. It is perfect for sport/scale/EDF models that use 2S or 3S Li-Po batteries and it is capable of a continuous 40A current draw. The motor wires are pre-soldered 3.5mm gold connector and the battery side is ready for you to add a connector of your choice. The original RRP when this was launched was �43.75! Do not use with 4 cells Li-Po batteries.